Carla Gugino loves the thrill of disappearing into characters, of becoming one with everything, from nurturing matriarchs ("Spy Kids") to hard-charging go-getters ("Entourage"). Fans often express amazement at her ability to capture such a wide range of personas, but Gugino credits her longtime acting teacher, Howard Fine, with giving her the tools to do so. "Sometimes I'll enter something where the [character] is very different from myself, but there's always that way of needing to connect to, where do you find it inside?" she muses. "The key for me and what's exciting is when I feel like I'm inhabiting them: They are in my bones. That's always a great reminder that I get from Howard." 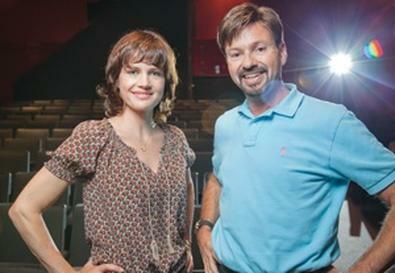 Gugino and Fine first met near the dawn of her career, when she was a teen actor looking for a good coach. The actor's agent, Peter Levine, introduced the duo, but they didn't work together extensively until Gugino needed to hone her audition for the 2004 Broadway revival of Arthur Miller's "After the Fall." She says, "I really felt like I needed somebody who had a real sense and history and prowess in terms of theater." Recalls Fine, "She was up against incredible odds. Coming from L.A., it's an immediate stigma, and Carla had done a lot of television and film. She was up against all the New York theater actresses, and it's cliquish. She had to be better than better." Fine's methods clicked so well for Gugino that she realized she wanted to work with him forever—and she nabbed the role. "We worked in a very particular way for the audition, because there were certain aspects of the play that no one had quite gotten to," she says. "It was about going all the way there for the audition in order to actually get the job. But then what was so fascinating and what made me go, 'Oh, I really want to collaborate with this person for a long time,' is the fact that once I got the job, Howard was like, 'Now you can let all of that go. Go back to the very beginning and don't know what you're going to do at all. At this point, it's about being as uncomfortable as possible, so you can really discover on a deeper level.' That was truly the biggest key I could've ever had." Fine has continued to coach Gugino throughout her career but notes that their relationship has never devolved into "neurotic dependency." "I never go on set," he says with a chuckle. "Carla's the artist. Imagine the surgeon bringing their teacher into the operating room. It would not inspire confidence. If I have to go on set, boy, have I not done my job." Adds Gugino, "I think that is really unique to [Howard], which speaks to his confidence. He has this amazing gift of teaching and of collaborating. There's not an ego-oriented ownership over really even his own work or his own craft. We cheer each other and support each other as mutual artists in a way that's really healthy." Fine speaks proudly of Gugino's many accomplishments, but he has a special place in his heart for the theater work he has coached her on: She followed up her triumphant performance in "After the Fall" with turns in "Suddenly Last Summer," opposite Blythe Danner, and "Desire Under the Elms." "Who leaves Los Angeles in the winter to go into the cold to do a play where you kill your child?" he says bemusedly. "I so admire Carla for what she does, and to be a part of that with her is remarkable." That said, there was one potentially uncomfortable moment that arose when Fine trekked out to New York to see Gugino in "Suddenly Last Summer." Thinking that he'd be seated somewhere unobtrusive, Fine couldn't help but panic when he realized he was sitting "dead center in the front row." "And their set was not raised," he says, laughing. "I'm thinking, 'Oh no. I'm directly in her sightline. And I don't want to be.' I tried to make myself small. But then after it started, I didn't think about it. I got so absorbed in her performance."